It’s been said that if you can change one bad habit, you’re likely to change another. This list will show you how being responsible pays (literally). In just one year, watch how making these small investments or spending habit adjustments will implement lasting benefits in your lifestyle. You can absolutely have a better life! Might as well start today! My best college friends and I have made a tradition out of spending St. Patrick’s Day together every year. This national just-for-fun holiday makes for happening festivities all over the country and is equidistant between the Christmas chaos and summer soirees. Pick whatever dates make sense for your group and plan accordingly. Buying plane tickets as early as possible alleviates sticker shock, while opting for home exchages or shared vacation rentals on websites like VRBO instead of opting for traditional hotel rooms significantly cuts travel expenses. Want another idea? Groupon even offers group getaway deals (I had no idea about these until recently.) Book now, enjoy later. No headache necessary. And, if you’re on a Spending Fast or Spending Diet look into less-expensive/free options like camping trips or Resort-style staycations at a friend’s house for the weekend. Up to 80% off LivingSocial Escapes packages! Peonies are just about the most stunning perennials, or annual blooms, that Mother Nature has to offer. Make a trip to the garden center this spring and pat yourself on the back for years to come. Flowers bud for about two weeks surrounding Mother’s Day, so pick a color that reminds you of her and spread the love. You’ll be happy next year when you have high quality knits, coats, and ski wear come the first snow of next year, especially since you got it for 60% off. Community Supported Agriculture (CSA) has become a preferred way for consumers to buy local, seasonal food directly from a farmer over the past 25 years. Participants buy a share (aka a “membership” or a “subscription”) and receive a box (bag, basket) of seasonal produce each week in return throughout the farming season. You’ll find that you cook more and dine less if you’ve got an appropriately stocked fridge to work with. Enliven your taste buds by eating vitamin-rich fresh food and get exposed to new vegetables as well as new cooking methods. Furthermore, you can do dutch. The librarians at the University of Colorado Denver get an order right to the school and divvy up the produce to bring home for their families. Find a CSA right near you by using the search engine on the official website. Walk when you can walk. It’s that simple. If you’re not in walking distance from your destination of choice, ride a bike or use public transit. You’ll reduce spending on gas and feeding the meter, which are both favorable options. Before I sold my car all together I elected for lazy Sundays. Enjoy the slow place. Say you make a trip to the grocery store, you’ll get only what you truly need versus what you want, saving you bucks and burning calories while you’re at it. Walking is the most painless exercise ever! Odds are there is a library located closer than you realize. Checking out books is a low-commitment way to nurture your curiosity, and a much cheaper alternative to shopping at the bookstore. If you’re the type of person that buys at least one book per month (I tried the Kindle and just can’t give in) you’ll save hundreds of dollars per year. For those books you’ve already purchased, wipe the dust off and pass them around! Starting a book-borrowing club with friends is just as easy as a trip to the library, and it’s more social too. My mom gives Seda France Travel Tin candles as hostess gifts and attaches a calling card with a short, personal note. Take her trick one step further and browse discount sites like Amazon for bottom of the barrel prices, or even better, find a local company to support. Then up the quantity and hold onto them, this way there will be no last-minute splurges on the way to the party. In 2011, I made this “Rock Out” banner out of rope and some glitter letter accessories I found on clearance. Originally a bedroom art piece, I realized that it would make for a super playful holiday decoration. I have a box designated for handmade decorations that I can reuse each year, thus enabling a custom, cost-effective look for years to come. Steady progress helps these hard heads of ours stay motivated. Set reasonable expectations for yourself when it comes to your automatic payment. Then, spend responsibly throughout the month and make an additional payment at the end of your billing cycle if you can afford to. Read this article from the Los Angeles Times about how decorator Emily Henderson and graphic designer/blogger Bri Emery exchange talents to avoid spending big. They’re just two talented girlfriends like you and me. Packing makes perfect. While lunch break is undoubtedly more stimulating at a bustling restaurant, this simple change could potentially save you hundreds of dollars per month. Dine with your close friends and make it count, not with your smart phone at the bar counter. Find a racket in decent condition at the thrift shop or on Craigslist and have a friend show you the ropes of this classic summer sport. You’ll spend your free time enjoying the beautiful weather rather than inside the gym. Check out your closest park to find public courts. A super social, super sweaty activity that’ll do wonders for your bod without the monthly membership fee. Let’s just do it, okay? We’ll be smirking next year and grinning in our 60s. Fresher coffee, fewer debit card swipes. Win win. Boil just enough water to fill your own cup of coffee and pour it over this cone that holds a filter of coffee grinds. If you want more than one cup, boil more water. Easy. Just like you use a signature perfume, select a signature color your nails. In college my friends knew me for having ballet-pink nails. This simple gesture customizes your look, making you look both fashionable and professional. (Unpainted nails are the first thing employers notice!) One bottle of nail polish versus routine manicures – you do the math. What positive changes have resulted in your life based on decisions you made last year? Pro-chance and fancy free, lifestyle blogger Lauren Mikus lives gratefully in the burgeoning city of Denver. Ha, love these. Every single one. Thank you! Such great ideas! If you can find a cheap one, I love my individual French press because then I don’t need coffee filters! I want to say I got mine at Starbucks for $16? these are all great points. Definitely have to try out a couple of them! Agreed! short, clean nails for healthcare as definately a necessity. However it does save on manicures and polish! If the first thing an employer notices about me is that my nails aren’t painted, I’m in big trouble. How about we scratch that one and substitute “find a charity to volunteer your time to” instead. Now _that_ is something that you’ll be proud of in a year! Where is your source when you say that unpainted nails are the first thing employers notice? Love most of these, but I have to agree with the other posters on the nails–on what information are you basing your statement that unpainted nails are the first thing an employer notices? Certainly we should all strive to be neat and well-groomed in the workplace, but that has nothing to do with whether we paint our nails or not. Nice, I am well on my way to feeling proud in a year! Just started getting produce deliveries from a local farm, and can’t believe I didn’t try it sooner. It encourages me to be fancy in the kitchen, but I’m saving soooo much compared to buying individual items at the store. Love this! Lots of great ideas that inspired other ideas. OK, for some reason the unpainted nails thing got me too. About 95 percent of the time I wear my nails short and unpolished, and I just got promoted. I work in retail. I really like this blog and this post, too, but the unpainted nails thing made me feel bad. I’ve been in on the hiring process during my working career, and I can tell you I NEVER noticed this. Maybe if you work as a manicurist-but I can guarantee you, no one else cares about this. Obviously I am not the only one this bothered. I like your other suggestions, though. I have been meaning to plan a girls’ trip for a long time so I am jumping on that one today! I love that these ideas are manageable! Small life changed that have an impact are so much more compelling/ doable than vague ideas. WORD on getting a library card! I get music, movies, books on tape for toad trips, and even textbooks in addition to leisure reads- it saves a ton of money if you use it! But I must agree with other posters about the nail thing… I get that being well-groomed is important in an interview, but my nails chip so freaking fast that I usually decide the employer would rather see clean, trimmed nails than chippy painted ones. I had a friend over to do homemade manis and pedis the other night and she had that nail polish brand called Opi and it has stayed on my nails so well! At least 6 days now which is totally unheard of for my nails. Usually that NEVER happens! Alas, even OPI doesn’t last on my nails for more than two days…must be something about my nails because no polish stays unchipped! Yea like others, the nail comment sort of irked me. Having my nails painted is something I should be proud of?? hmmm probably not. Actually, I don’t even have to wait a year to feel good about number 15! Every time I do it I feel sooo good! Great list! Loved this so much! I’ve done several of the things on the list at one time or another, and it’s true! All of those things, looking back, make me feel good. Great list! I also like using the library to rent movies. You have to wait a few more months to watch a movie, but it’s free! My family likes to get together for movie nights, make a nice little supper or snack and enjoy a free movie or two! Instead of planting peonies, which have to be watered a ton and don’t last through winter cold snaps, plant dahlias instead. Much less work! Also, you can check out ebooks from your library. Check out their website, most have you download the Overdrive app. You can get ebooks for Kindle through your library too! Ohh! Love the idea of going with dahlia’s! I didn’t know they were so much more hearty than peonies. And, those ebooks from the library are SUCH a great resource! I have to agree about passing up the peonies for other flowers. Peonies need ants for pollination and thus attract them like crazy. It’s virtually impossible to shake all the ants off the flowers if you want to cut them and bring them indoors for a bouquet. Also, if you’re careless enough to plant close to your home (as the previous owners of our house did), you risk getting overrun by ants whenever they have a reason to want to get inside (e.g., heavy rain, cold snap). I’m assuming that the nail painting thing applies to men too? Ridiculous! I’ve been promoted again and again and I am sure it has had nothing to do with nail polish. The other suggestions are good but this last one belongs in the dark ages. Disappointing. I’ve heard that messy, unkempt nails are one of the things potential employers notice. Having worked in the modeling industry, the standard was always clean, groomed, short, and unpainted or clear coat nails. It is considered a professional look. When I went into the business world instead, I actually lost a job (last minute Interview I was not expecting) because my nails were red and considered “too flashy” to be a good fit. Also, in modeling, they taught us to never wear perfume to an interview or potential client meeting as, if the client or interviewer disliked the scent, they were far more likely to disqualify you. Just some tidbits from my personal experiences. I think the nails thing was more about being proud of the money you can save doing it yourself instead of paying 20+ for a mani. Great list all around! I just recently discovered a free and excellent website (and app) called duolingo.com. I think that learning a new language (or brushing up your high school Spanish or French) would me you proud of yourself in a year. The 401(k) for corporate workers,the 403(b) for non profit, the 457(b) for municipal employees plus a Traditional IRA, and a Roth IRA all can be your solution to a comfortabe retirement. Put in from 3 to 8% of your salary every year. Why do you resist and not utilize the tax rules to your advantage? There is even a Savers Tax Credit for those with smaller incomes! No excuses. Social security is not going to provide the income you need. 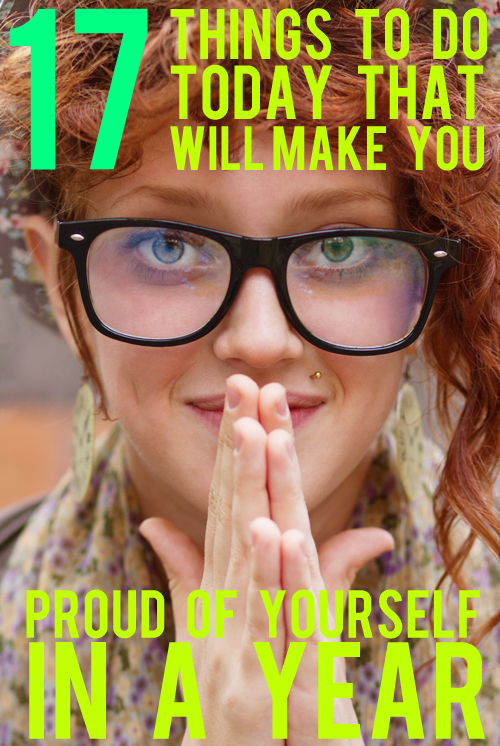 Do this thing this year and next year you will be so proud of yourself. I am a hiring manager and I couldn’t care less if a female applicants nails are painted. I care that they are clean, neatly groomed, and IF painted, that the color choice is professional. Great ideas! I love perennials and have just recently started packing lunches. Also I joined a library 5-6 years ago and at first, we didn’t use it much but man-oh-man these winter months would have a stir crazy if we didn’t have the library to hang out in. They even have a block section, a dress up section, a kitchen, and someone there is really creative and makes pirate ships/trains/houses out of boxes. It is so much fun! Love to join a CSA next! Thanks for the great list! If you have trouble with getting nail polish staying on, try getting a base and top coat, it should last better than just the color. Also, for some painting nails would be something to be proud of. I have the nasty habit of biting my nails, and refuse to paint the stubs i have now, so painting them would mean that I finally broke that habit. But, the way shes put it in this article is bad. I don’t thinkb employers would notice that first. Rather, ur general appearance. As long as u are clean, tidy, and put together, and dressed to at least the standard expected in the industry, they won’t notice that ur nails are clean and well shaped but heaven forbid, unpainted. Rolling my eyes a little at the thought.